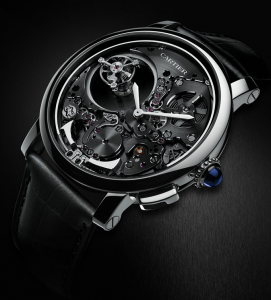 Rotonde de Cartier Minute Repeater Mysterious Double Tourbillon Was Honored For POINCON DE GENEVE! Cartier fused advanced watchmaking technology with unique aesthetics to create an iconic timepiece-Rotonde de Cartier Minute Repeater Mysterious Double Tourbillon with an extraordinary movement which includes features of the mysterious movement and minute repeater. Rotonde de Cartier Minute Repeater Mysterious Double Tourbillon added a brilliant new chapter to the history of Cartier sophisticated timepieces. The clever combination of sophisticated functions and the round watch case of Rotonde de Cartier watches makes the watch be the good model in advanced watchmaking field. 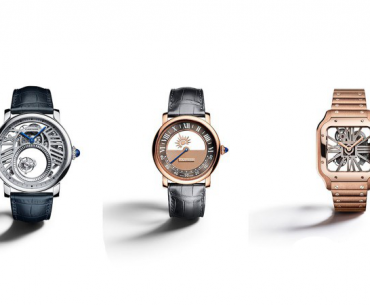 The Rotonde de Cartier faced two serious challenges: Cartier Cal. 9407 MC that consists of 448 parts and the 11.15 mm-thick watch case challenge the technology; Black rhodium plated movement that sets off mysterious beauty of the double tourbillon and the rhythm of minute repeater mechanism reveal natural but unique aesthetics. It was in 1912 that the first Cartier Mestery Clocks, Model A with a mysterious movement made its appearance.The double tourbillon originates from that classic timepiece. 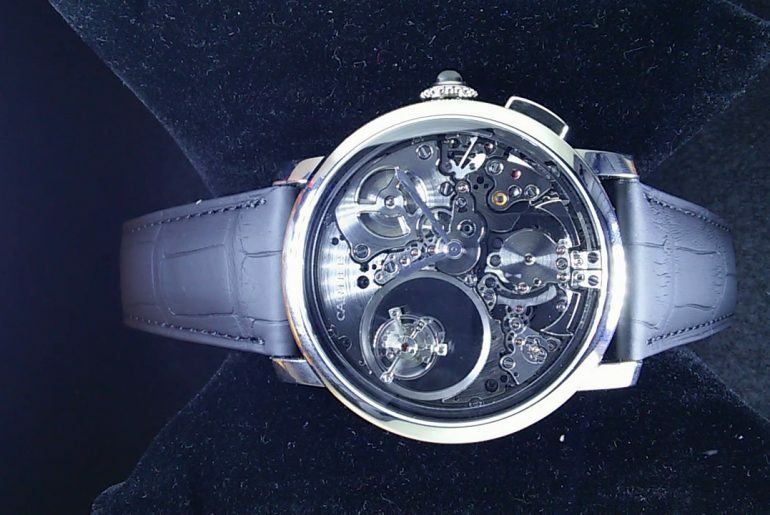 It seems that the floating tourbillon that rotates in a circle every 60 seconds doesn’t any connection with the movement. 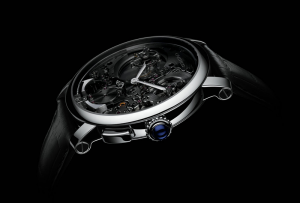 Sapphire crystal disc above the tourbillon spins in a circle every five minutes, mysterious and charming. The double tourbillon is arranged on the eccentric position of the sub-dial between 9 and 10 O’clock. The minute repeater mechanism was set at six O’clock, whose hour hammer and minute hammer show an iconic style of Cartier watchmaking. Equipped with manufacture mechanical movement with manual winding, Cal.9407 MC, Rotonde de Cartier Minute Repeater Mysterious Double Tourbillon brings unique hearing enjoyment. To grow the intensity of timing, the weight of Rotonde de Cartier Minute Repeater Mysterious Double Tourbillon is reduced to minimum. First, Titanium watch case. Second, reasonable skeleton design for the dial helps the weight of the case reduce by 50g. Besides, four connecting points between the movement and the case and additional connecting points between the movement and the gong keep transmission of vibration. The big case for 45 mm supplies the best environment for increasing resonance chamber. To create tuneful sounds, Cal. 9407 MC used B bassoon and D high gong to strike the hours and minutes. After minute repeater mechanism is started, the fly-wheel with a mute system at 7 O’clock guarantees the purity of sound. The uniqueness of minute-repeating sound depends on the geometrical morphology and materials of the gong. Chilled-steel square section gong can express rich timbre, including eight kinds of harmonics. Length of sound depends on the precision that the hammer hitting the gong. Square section gong can control the range of hitting of the hammer, hence the system is easy to maintain the consistency of each shot. The fly-wheel adjust the speed of which the hammer operates, so the tuneful sounds are guaranteed. Cartier Displays Outstanding Watchmaking Technology At 2018’s SIHH!